Wine Jale Cusumano, vinified entirely from Chardonnay grapes, it shows a lovely pale yellow color, intense bouquet offers, open, rich scent of peaches, apricots, pineapple and flowers of broom. 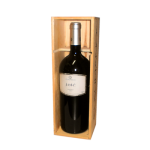 It 'a wine of intense personality in which the proper use of the wood allows progressive expressions and complex aromas. The taste develops a complex web where you can understand the linear concentration and the final ending. It goes with fish, pasta and fish dishes, shellfish and medium matured cheeses. Serve at 10 ° - 12 ° C.